As political unrest brings increased violence in Burundi, Mennonite Central Committee’s (MCC) partners continue building on two decades of peacebuilding to encourage peace. The current political unrest began in the spring of 2015, when President Pierre Nkurunziza’s political party nominated him for a third term. Some Burundians believed his nomination was unconstitutional, sparking protests that became violent. After the president won the election, members of the opposition movement were targeted for imprisonment, torture and assassinations. Independent radio stations were destroyed, allowing rumours and inaccurate information to be disseminated. However, sprinkled like salt across Burundi are peacebuilders who have been trained at MCC-supported trainings during the Burundi Civil War in 1993-2005 and at the Great Lakes Peacebuilding Institute (GLPI) since 2004. Some peacebuilders share their knowledge with members of hundreds of community peace committees that have spread across Burundi since 1994. Peacebuilders and the thousands who have been trained by them have worked diligently during this situation to keep violence and ethnic conflict from escalating. Emmanuel Ntakirutimana is one of those peacebuilders, he works in Cibitoke, a western region where conflicts between youth from different political parties have caused tension in the community. He has been coordinating a project since 2013 that brings youth together to learn the practical skills he learned at GLPI — conflict transformation and prevention, non-violent communication, how to manage rumours, tolerance and mutual respect. Youth meet twice a week with their local administrator (mayor) to discuss problems in the community and look for positive solutions. Only two months after the project started, youth who previously refused to even greet each other on the street were sitting together regularly and discussing their differing views, Ntakirutimana said. However, in this year’s election period, members of the Ibonerakure, the youth wing of the ruling party, started placing a white mark on each house where a Tutsi family lives. This caused people to fear that the political dispute would become an ethnic dispute, pitting Hutus and Tutsis against each other against each other as they were during the civil war. A rumour spread quickly that the Ibonerakure-associated youth were working with a rebel group to prepare a Tutsi massacre. People believed that a certain Rwandan businessman was using his warehouses to hide machetes and gasoline in order to attack Tutsis and burn their homes. This rumour caused numerous people to flee Cibitoke, but Ntakirutimana saw that this rumour would be easy to verify. He sent members of the project’s youth discussion groups to talk to this businessman who gave permission for the group to go through his warehouses to verify that he wasn’t hiding anything. Discussion group members were able to calm the community, confirming that the rumour was not true. Ntakirutimana said that people in the community also have protected those who were targets to be assassinated. “Rather than dividing over political values or ethnicity, they are choosing to unite to protect their community, understanding that everyone has the right to live even if they have different ideas,” said Ntakirutimana. 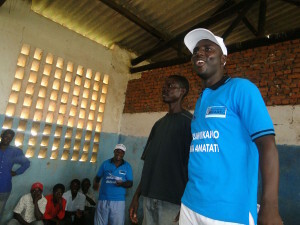 Ntakirutimana is among 200 GLPI alumni whose peacebuilding training was paid for by MCC. They do peacebuilding work across the African Great Lakes region. MCC is a global, non-profit organization that strives to share God’s love and compassion through relief, development and peacebuilding. In all our programs we are committed to relationships with our local partners and churches — their needs guide our priorities. We strive to make peace a part of everything we do. When responding to disasters we work with local groups to distribute resources to minimize conflict. In our development work we consult with communities to make sure the projects meet their needs. And we advocate for policies that will lead to a more peaceful world.